Personal chefs plan a menu, grocery shop, and prepare customized make-ahead meals in their clients' homes. Most personal chefs cook for their clients weekly, bi-weekly, or monthly. 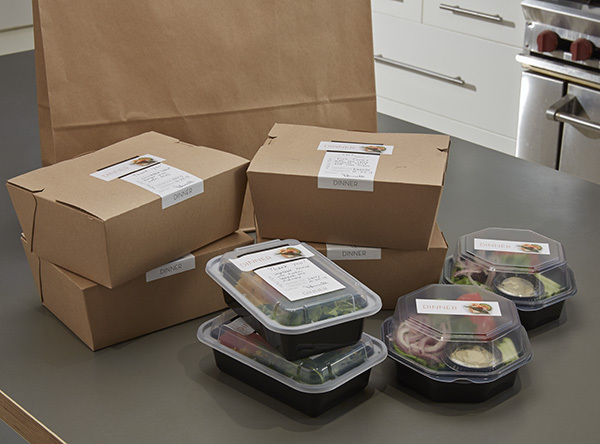 Meal delivery provides customers with prepared meals delivered to their homes. These services individually package pre-portioned meals and deliver them daily, weekly, monthly, or as needed. We’re NOT referring to delivery from restaurants in this article. A personal chef procures fresh ingredients at a local grocery store and prepares high-quality meals using those ingredients in your home. They can shop for whatever quality of ingredients you’d like. For example, if cost isn’t an issue and you’d like grass-fed meat, they can buy it for you. Many personal chefs have years of experience cooking in restaurants and hotels, so simply put they can make better tasting food than the average Joe. In addition to the make-ahead meals for the week, a personal chef can plate a fresh meal while they’re in your home. The supply chain required to run a successful meal service means that most companies are mass-producing meals in a factory, freezing said meals, and packing them in a cooler for delivery. By the time they get to your home, sometimes the meals don’t taste as fresh and aren’t visually appealing. That being said, there are certainly some meal delivery services that do a better job than others. More of them are now using organic and higher quality ingredients. Personal chefs are all about providing a unique in-home experience for clients. Chefs For Seniors' personal chef services range from $95-$139 + grocery per visit depending on our client’s unique tastes and preferences. Based on our research of dozens of personal chef services throughout the US, the service cost to have a personal chef prepare 12 servings of meals (typically 4 or 6 different entrees) ranges from $100-$400. The median is around $200, with prices being a bit higher in large metro areas – LA, New York, Chicago, Miami, etc. Chefs charging in the $300-$400 range are typically in large urban areas, are highly acclaimed, and have years of experience in high-end restaurants. Typically the lower cost personal chef services in the $100-$150 price range are part of a larger franchise network or have a team of chefs working for one business so they can benefit from economies of scale. Fortunately, you can work with your chef on a grocery budget and can adjust the service frequency. For the less expensive personal chef options, your cost per meal will range from $9-$18 per meal. It can be as much as 3x that for more expensive chefs in large urban areas. With so many options out there for delivered meals, it’s not hard to see why there’s huge variability in price. For example, local Meals On Wheels programs (which deliver a hot meal to seniors), typically offer a free or partially subsided meal through Older American’s Act and private donor funding. On the other end of the spectrum, there are higher-end meal delivery companies that charge $30+ per meal. In terms of an average cost for your standard meal delivery service, most run anywhere from $8-$17 per meal. There’s definitely a correlation between cost and quality for most meal delivery services – you get what you pay for. You also have to factor in shipping cost for many meal delivery services, which can run anywhere from $10-$30 per box. Food is subjective, and one of the biggest, if not THE biggest, benefits of having a personal chef is the level of customization they can provide. They’re not mass-producing meals, rather they’re preparing meals just the way you like. This is true for both dietary concerns and food preferences. Love cumin? Great, your chef can add it in. Have low-sodium or gluten-free diet concerns? No problem. A key advantage with a personal chef is that they get to know you on a personal level and can create customized menus that you'll enjoy. This is probably the area where meal delivery services are weakest. Because the meals are produced in a centralized kitchen, it’s not cost-effective for them to customize meals for individual tastes and preferences. The meal you get is the same as what everyone else gets, even though your preferences and dietary concerns are unique to you. The personal chef industry is relatively new, and there aren’t companies providing in-home cooking services in every community. This is especially true for smaller, rural areas where personal chefs might struggle to find clients. You’ll tend to see personal chef service in larger, urban areas and the surrounding suburbs. For the meal delivery companies that ship frozen meals, one of the big benefits is that you can order their meals from just about anywhere in the country. Companies that deliver refrigerated meals typically have more restricted service areas. There are 100's of meal delivery services available throughout the US, and meals can be shipped just about anywhere. A lot of people don’t think about this, but a personal chef can actually take information directly from your doctor or dietitian on what you should be eating and execute that plan. Its kind of like your healthcare provider is the architect and your personal chef in the carpenter. Any good personal chef will work with their clients to accommodate just about any dietary concern or food allergy. However, one downside of a personal chef service is that they cannot provide an exact caloric or nutrient breakdown for the dishes prepared. There are some meal delivery companies that offer meal packages for specific diets, such as Paleo or gluten-free. In fact, you can probably find a meal delivery service for just about any type of diet. Plus, most meals provide a nutrient breakdown that is helpful for people looking to lose weight. One downside of delivered meals is that many contain preservatives and sodium that aren’t very good for you, plus you aren’t able to alter ingredients in the dishes if you’re allergic or have certain foods that are incompatible with your diet. Only you know your priorities for a meal service. Consider these different characteristics we examined in this article as you determine the best fit for you and your family. If you're interested in learning more about personal chef services, we want to answer any questions you have! Even if you're not a senior.